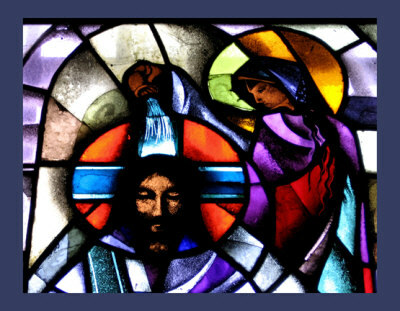 I preached this sermon Maundy Thursday, 2012 at Grace Episcopal Church. On our way to Jerusalem at a little market in one of the little towns we passed through, I bought the oil, and I hid it among my things. Who’d think that such a little container could weigh so much. And how it weighed on me. At some point Jesus started talking about what would happen in Jerusalem. How he would be betrayed and handed over to the religious authorities. How he would be crucified, and die. Then somehow how three days later rise. And it went on and on and on. Be glad those who wrote your gospels cut so much of their bickering and fighting out. Oy Vey they could go on forever. [PAUSE] But then the gospellers were good at editing their stories to suit their communities and what they thought was proper. That’s what they did to me. My deed will always be remembered. But not my name. And the reason for my action was changed to suit what a woman could do. Not what I did. Now I understand my story has come down to you in several stories and is confusing. Different women. Different times in the story. Different reasons. Luke even watered my act down to a penitent sinner thanking Jesus for forgiving her many sins. He removed it entirely from the Passover and Passion all together. At least John put it a week before Jesus’ death and resurrection, but then he had Mary of Bethany anointing Jesus’ feet for a whole other reason. But, you see, I didn’t anoint Jesus’ feet. I didn’t do the womanly thing—anoint him for his burial. That was women’s work back then—anointing a body for burial. Anyone who touched a corpse was considered unclean. We women were unclean for a whole week during our periods, so what’s a few more unclean days to us? It was the night before the Passover, two days before the Crucifixion. Tensions were running high all around Jerusalem as they always did during Passover. There were Roman soldiers everywhere to squelch any uprisings or rebellions that might start. We already drawn their attention with Jesus’ entry into Jerusalem. There had been crowds of people cheering Jesus as he rode into the city. They called him the King of the Jews and Messiah. Then there was the fracas in the temple. Jesus’ prophecies of Jerusalem and the Temple being destroyed didn’t sit very well with anyone either. The religious leaders were trying to catch him in his words, trying to find a way to arrest him without making the crowds go crazier than they already were. The Twelve were bickering about who was the greatest, who would sit at his right and left hands when Jesus ruled. It wasn’t hard to see where all of this was leading. And I knew. I knew when Jesus said he was here to die, he meant it. I knew it in my bones. But I also knew what God commanded me to do. Jesus was the Messiah, the King of the Jews. And a king must be anointed. That night, the night before we celebrated the Passover in the Upper Room, God’s command came. We were at the house of Simon the Leper. I quietly left the feast and went to my things. I retrieved the alabaster jar that had weighed so heavily on me the last few weeks. I returned to the banquet and walked to where Jesus reclined. I stood behind him, raised the bottle, broke its seal and let the oil pour over Jesus’ head. It ran through his hair, down his face, and it rolled through his beard. His shoulders were drenched from the nard. The smell filled the room. He was anointed: Jesus: The King! Jesus: The Messiah! For a moment there was dead silence in the room. Then all hell broke loose. “Who are to anoint the king!” yelled Peter. No!” Judas jumped into the fray. “The anointing means nothing if a prophet or priest has not done it! We have to take Jerusalem first. Then Caiaphas will have to anoint Jesus as King of the Jews! It is time to fight!” Judas yelled, pulling out his dagger and raising it in the air. “Enough,” said Jesus. His authoritative voice rising above all of their yelling. “Leave her alone! Why are you troubling her? She has proclaimed the truth! She has done a good deed for me. Wherever the Good News is preached in the whole world, what she had done will be told in memory of her. Silence reigned in the room once again. The Twelve were horrified Jesus allowed a woman to anoint him King after his triumphant entry into Jerusalem and the cleansing of the Temple. Judas was seething. I could see him grinding his teeth to keep from saying anything. People began to pick at their food, no one quite looking at another. None of them saw that there would be no triumphant overthrow or Messianic reign. None of them saw Jesus’ way, his way of reigning, was going to lead to very different places than what they were imagining. All they could do was fight about who should have anointed Jesus king. I think Judas was beginning to see Jesus would not be the king he wanted. I saw him slip away from Simon’s house later that night. I’m not sure when changes were made to my story. Changes like me anointing his feet as well as his head then just his feet. I don’t know when the anointing became just about his burial and not his kingship. I don’t know when or why the anointing story got moved first a week before the Passover then a few days before that. I don’t know when Mary of Bethany became the anointer. I don’t know when the argument became about the waste of money and not that a woman anointed Jesus as King of the Jews. Although I’m sure that’s the first part of the story that was changed. Then there’s Luke. Luke moved it entirely out of the Passion narrative and Jerusalem. His anointing takes place it in Galilee. There the woman who anointed Jesus was a sinner, nudge nudge, wink wink, a whore, and the anointing of the King was lost entirely. For the record: I was never a whore. I was one of those women of means like Mary Magdalene and Joanna who followed Jesus in Galilee and then onto Jerusalem. I was one of Jesus’ disciples. I heard his teaching. I saw his miracles. And I saw things the Twelve didn’t see because they ran away. I saw his trial. I saw Jesus crucified. I watched him take his final breath. I stood vigil with his mother and Mary Magdalene and Salome, as we watched Joseph and Nicodemus lay him in the tomb. We held that vigil for hours until the Roman soldiers made us leave. “Where ever the Good News is preached—in all the world—this story will be told in remembrance of her.” In memory of me. I know it’s a bit ironic my name was forgotten. But does it matter? No, it doesn’t. Because all of us are anointers. All of us in our daily lives anoint Jesus as king. When we help someone, when say kind words, when we love our neighbor we anoint Jesus as king. In a small act of giving change to a homeless man or a large act like marching through our city holding vigil against the violence in our city, we anoint Jesus as king. All of us by our lives, our words, and our acts of love anoint Jesus as King and Messiah. This story is told in memory of us.